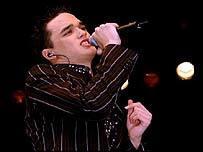 Pop singer Gareth Gates has qualified as a speech coach after passing a set of exams. The Pop Idol runner-up, who suffers from a stammer, will help other speech instructors and could offer new pupils one-to-one advice. The Bradford-born singer can expect to earn up to £500 a week if he takes up his new occupation full-time. "I am really chuffed I am able to teach as it helped me so much," said Gates, 19, who is signed to BMG Records. Gates has been attending stammering workshops for the past two-and-a-half years. Iain Mutch, from the McGuire Programme which runs the workshops, says Gates will not take any lessons on his own because too many fans are pretending they have speech problems in order to join his class. "Gareth's definitely got what it takes to teach and there is a job here for him whenever he wants it," said Mr Mutch. "He's got charisma and ability and at last can speak to a room full of people." "Unfortunately I think he will have to wait until his career dies down a bit before he takes classes on his own," he added. Gates denied rumours last week that his record label had dropped him. "I haven't been dropped as rumours have suggested," he wrote on his official website. "In fact I'm actually working on new material and am really, really happy, so don't worry," he said. BMG Records and Gates' management company 19 also scotched the suggestions. "This is ridiculous. We have not dropped Gareth Gates," said Tim Bowen, chairman of BMG. Londoner Gareth "proud of Bradford"